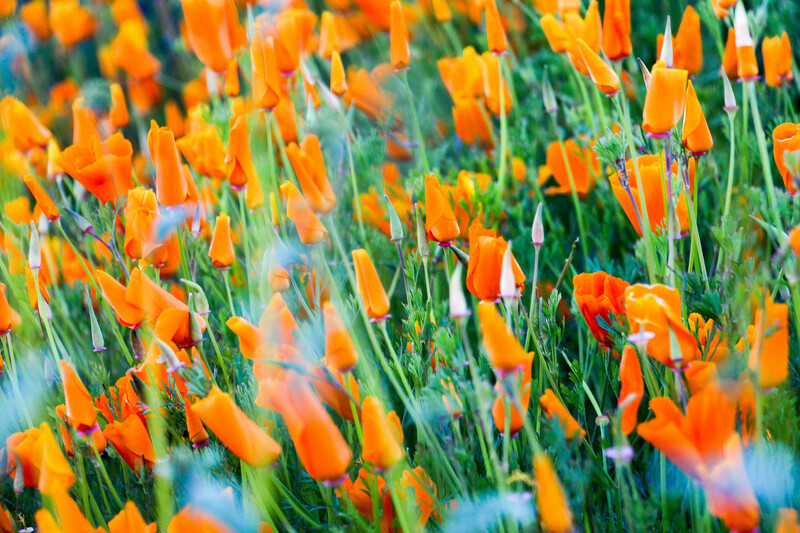 Spring is finally here, and with it, fields of blooming wildflowers across the state of California. 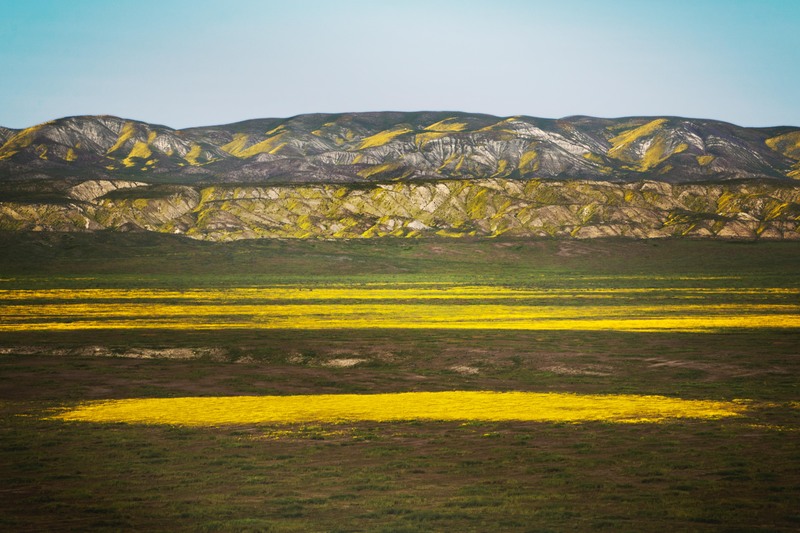 Last year’s super bloom was well, super, and we’re anticipating yet another year of poppies, lupines and goldfields carpeting California’s deserts and rolling hillsides. You may have hated all the rain that showered the state this winter, but on the bright (and colorful) side, the increased levels of precipitation are making for another spectacular “super bloom” this Spring. Normally, super blooms only happen once every decade or so, as you need the right conditions to align in order for the wildflowers to appear in full force. What makes a super bloom, you ask? It requires an abundance of rain, a lack of wind and milder temperatures which, when put together, creates the perfect conditions for desert and chaparral landscapes to erupt with wildflowers, some even rare species that only bloom every few years. These blooms usually start in early March and only last a few weeks. So, as avid explorers and wildflower enthusiasts, we’ve done a bit of recon and put together a list of the top places for you to you to experience the super bloom for yourself. Did you know that Anza-Borrego is California’s largest state park? Normally a dry and desert landscape, Anza-Borrego comes alive in the Spring, putting on a colorful show for a few weeks each year. Come for the flowers, but stay for the slot canyons, natural palm oases and free camping. For those living on the Central Coast, Carrizo Plains is just a hop, skip and a jump to see expanses of purple, yellow and orange flowers carpeting the already lush green hills of Santa Margarita. Rumor has it, the intersection of Highway 58 and Seven Mile Road just outside the monument has the best display of flowers currently. Make the trip down Highway 101 to Figueroa Mountain and view the impressive display of poppies and purple shooting stars covering the summit and surrounding hillside. Snap a few photos then spent the rest of the day hiking the Grass Mountain Trail to the summit, which also happens to be a great vista for wildflower viewing. Lake Elsinore, located South East of Los Angeles is one of the most popular spots for wildflower enthusiasts, and for good reason. We recommend taking the 3.5 mile out and back hike through the open expanses of wildflowers on Walker Canyon Trail. Make sure to bring plenty of water with you as there is little shade along the trail. Because of the Woolsey fire last year, biologists are predicting that Malibu Creek State Park could be a hotspot for wildflower viewing this year. The scorched soil created by the fires create optimal conditions for seeds of certain flower species to germinate. And as always whenever you’re in the outdoors, be respectful of Mother Nature. Follow park signage, stay on the trails, and do your best to leave no trace (which includes not disturbing the flowers). We are already seeing certain locations blooming, so don’t miss out! Adventure Aide is hosting a day trip adventure to see the super bloom on March 31st, more details coming soon.